The one that you just tore apart. And didn’t bother to explain. A long sad song I try to hide. You are my pain and every tear. Wishing to be you and not feel a thing. Instead you left me at my worst. I’ll love you always, my paramour. I can’t forgive what you have done to me. It’s time I close the music box. Boy, do I understand what pain certain objects bring; a fine poem, J.B! Precious memories entangled with possessions, ah, I don't know hwat I'm saying, jaylisbeth, but it was an excellent poem. I appreciate your words, dear friend. A symbol of pain, a symbol of sorrow... The musical boxes we own or we borrow! Notes in our ears, our hearts, or our heads; Bringing the memories, dreams in our beds! Long before pain, they heralded gladness... Why then do now, they only bring sadness? Can't we recall those happiest days? Why only sorrow, when music-box plays? Plain, you've expounded on feelings & thought; Pain didn't have to 've been musically brought! As Princess, & freeborn, you have a choice... Ignore or pay heed to that obstinate voice!! Choose your choice wisely my sweet noble friend; Choices have consequence, unto the end! they ease up my pain and the continuous fears. a friendship like ours i know that is rare. I will never stop thanking you for all the advise. Thank you for that, my sweet friend! I very much appreciate it! The arrangement and rhyming and the flow of this poem shows that you're a good poetess. Real good work! Emotionally powerful. You've expressed your pain with exacting clarity. But amidst the pain there is courage and perseverance - something to be respected. 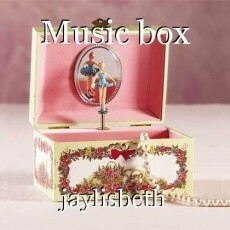 It's sad when something so beautiful like a music box or even a person stands as a symbol of pain and heartache. An ode to the one who makes our heart sing... the blues. Loved this one a lot, jaylisbeth! Thank you very much, quite personal.